Hi all! 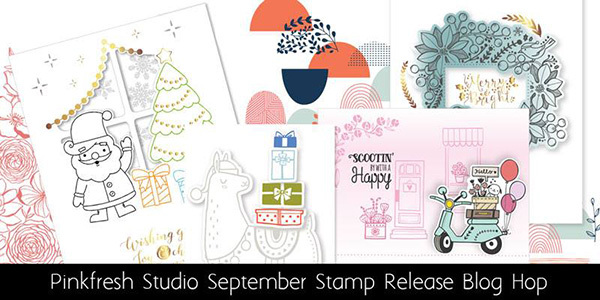 Welcome to my part in the Pinkfresh Studio Stamp & Die Release Blog Hop. You've probably arrived from Amy's blog and we're just warming up! I've got some fun, simple stamping projects for you, and a chance to win a huge stamp & die prize pack, just for leaving a comment*! Be sure to read all the way through, and visit all the blogs, leaving comments along the way. Everyone's worked really hard on their projects, so there is much to see! I'm starting out with one of my favorite techniques--creating your own gift wrap with stamps. The Semi-Circle Patterns set by Inna Moreva is probably my favorite set in this release (though it's pretty hard to pick a favorite in this mix ;), so I definitely wanted to use it in a fun way. I thought modern gift wrap was the way to go. I started out with plain white printer paper (in bright white!). 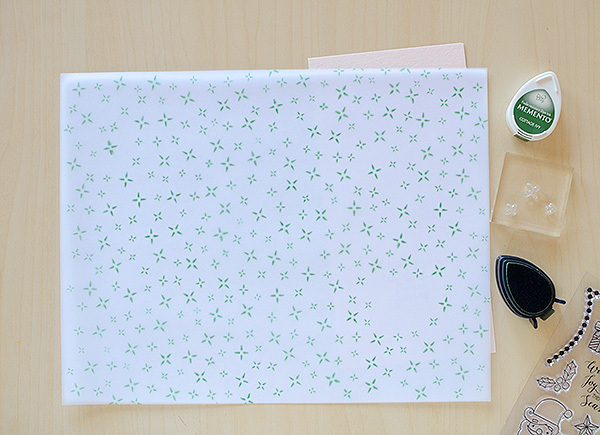 If I'm wrapping a small gift, this is my favorite paper to use for creating my own stamped paper. I started by stamping a simple pattern with 3 different half circles, in 3 different colors. I repeated the pattern until my entire 8.5" x 11" sheet was covered. Then I wrapped my 4" x 4" white box. I made a little matching card to go with it next. The card is a 2.75" square and features one set of the colored shapes. Because the pink is very pale, I was able to clearly stamp "make a wish" over it; you can find the sentiment in the Playful Animal Friends 2 set. 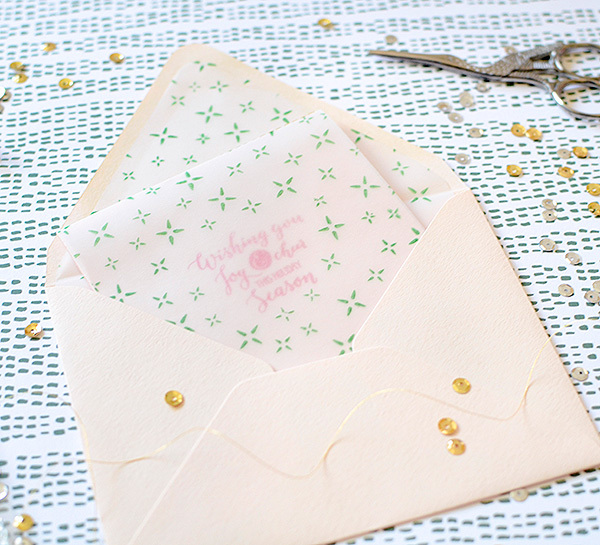 I made a simple open square 3" envelope from vellum and tucked the card inside. I tied it to the top of my box with some silver-white tinsel twine, and a pink fringe bow. It was all so simple, but the fantastic images and color scheme make it modern and eye-catching. But it worked! After a sigh of relief, I stamped the black band of the bulb on the inside of the card, using the cut-out front as my guide. The next stamp was "you brighten my day" which I also stamped on the inside of the card using the same technique. I wrapped some black baker's twine around the right side of the card as a finishing touch. The stamp set has so many pretty images and sweet sentiments that I'll be using it often and doing a little bit more die cutting on the front of my card! We're getting festive in my last project! I'm so excited to start thinking about the holidays! Mind you, I'm not wishing away fall (no way! ), I'm not looking forward to the holiday madness, and I'm in no rush to put up my Christmas tree or decorate my house. As a crafter, though, I AM eager to think about making holiday cards and tags, and what sort of gift wrap I'll be doing this year. By chance, when I went to begin my projects for this blog hop, I had a piece of plain vellum sitting on top of some blush pink card stock. 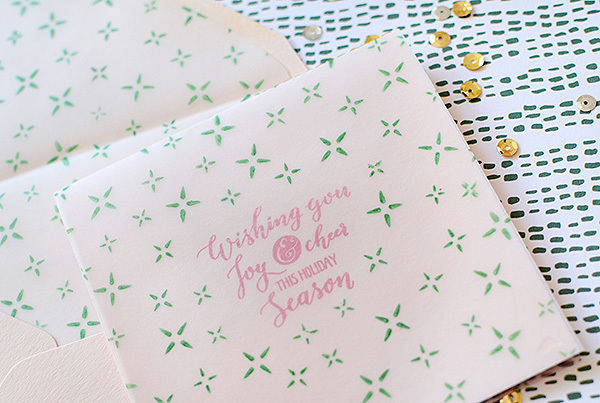 As I looked through the stamp sets, eyeing all the fun and pretty holiday stamps in the mix, I had an idea for an all over pattern on the vellum with a simple sentiment stamped on the blush card. Kind of like a frosty window. To begin, I stamped the message in red ink in the center of my card. 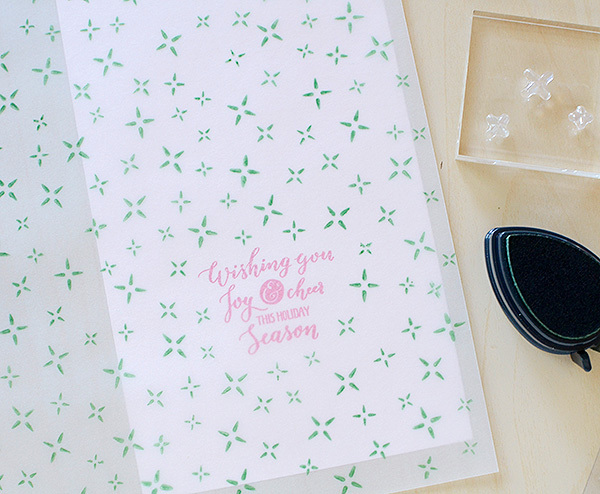 I lay a sheet of 8.5" x 11" vellum over it and began stamping away, choosing a holiday green for my ink color. I was careful not to stamp too close to my message, as I didn't want it to be covered up. I put the trio of ice crystals on the same stamp block for quicker stamping. I ended up covering the entire sheet with the green pattern, having an idea for the leftover bit later on in the project. I allowed it to dry thoroughly, so that the ink wouldn't smudge when touched. Then I aligned it with my card, marked where it needed to be trimmed to fit over top of it, and cut. The card size is 4" x 8", and the vellum is just slightly taller, taking into account what might happen when I folded the two pieces. I didn't want the vellum to be shorter than the card stock. Once the vellum was trimmed, I stitched it to the card at the top crease. The card was complete, but I still had a sizable piece of stamped vellum to use, which I thought would make a pretty envelope liner. You can find liner templates all over the internet, and full disclosure: I wish I had used one of them! I just eyeballed mine and while it turned out decent in the end, it would have been much easier to go off of a template. Well, I hope this post gave you a few things to think about...I imagine you'll have an endless supply of ideas from all the girls when you've completed the hop! That's right, you will receive the ENTIRE release! That's a whole lot of stamps and dies! To be eligible to win, please leave a comment on every blog in the hop. 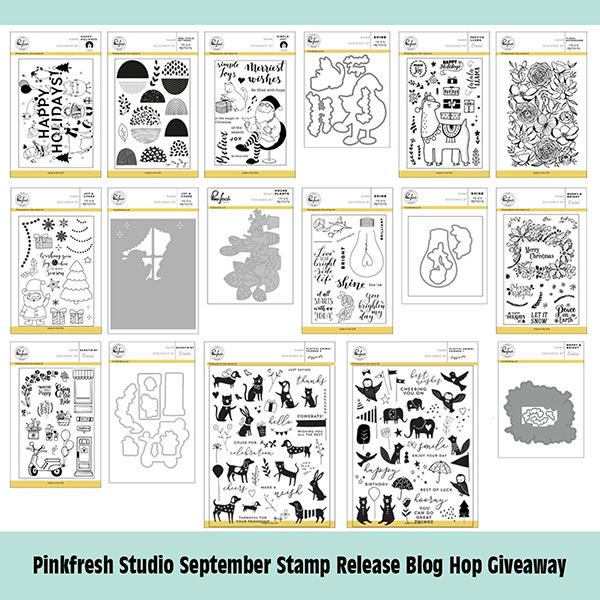 There will be 1 winner, randomly selected; winner will be announced on the Pinkfresh Studio blog on October 9th. Comments close at 11:59 CST on Monday, October 2nd, 2017. Good luck! Rebecca Luminarias - That's me! Rebecca usted nunca deja de sorprenderme sus trabajos son tan bellos que es muy difícil escoger cual es más lindo que otro, realmente proyectos maravillosos los suyos !!! 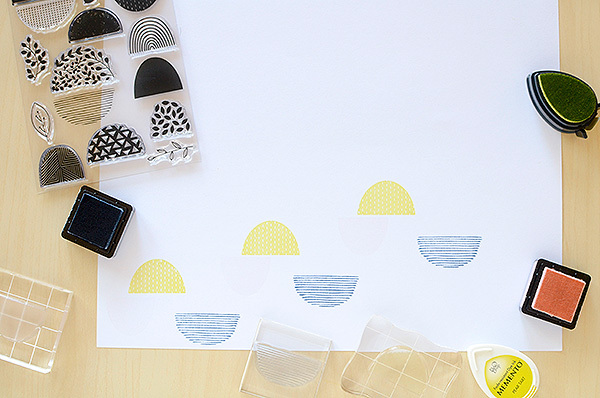 I just love this background stamp and how you created so an awesome paper. Breathless. Thank you for showing the semi circle stamp set. I wasn't really sure about that one, but now that I see it up close, it may be my favorite. I like sets that are versatile, and that one really fits the bill. These designs are so amazing! They are so light and bright and lovely! I love the soft pastels and the crisp whites. 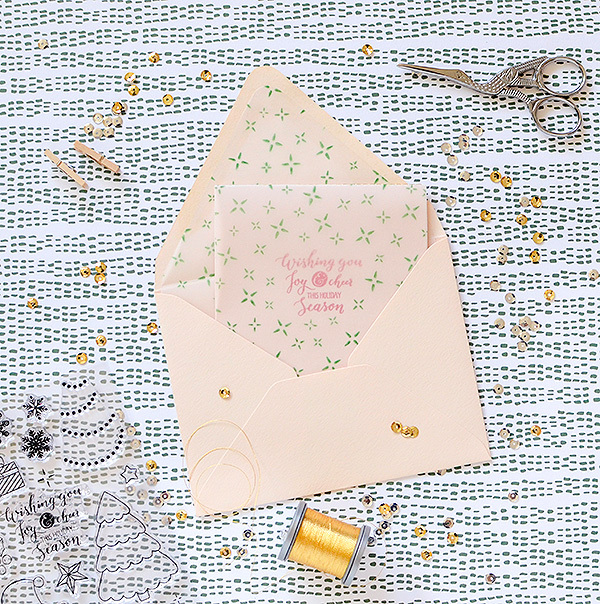 Your projects are wonderful and like how you created your own gift wrap! 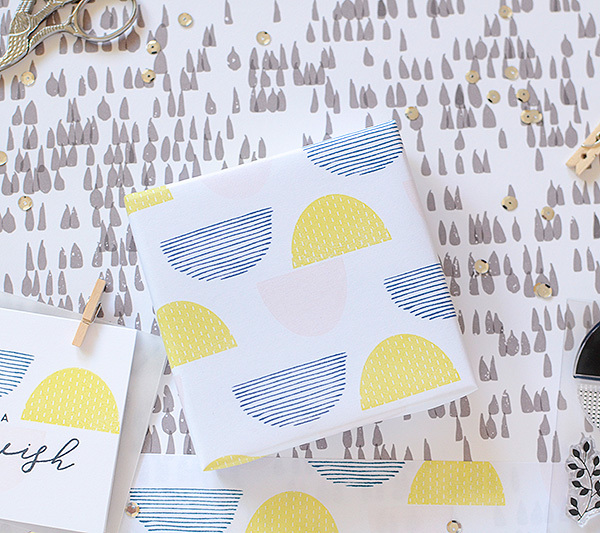 I love how you took a simple pattern and turned it into beautiful wrapping paper! I love your unique take on using the stamps in the release. I love lined envelopes, so I particularly liked your example of that. Your projects are all amazing! The semi circle is awesome for wrapping paper. Love that idea! Love the designed envelope as well. Gorgeous! Love what you did with the semi circles. It is an intriguing set. I love the gift wrap and card you created using Semi Circle Patterns stamp set. Thanks for the stepped-out directions for all of your beautiful creations! Beautiful! I'm glad you used the half circles, that's my favorite. But of course all of your work is just stunning. Hermoso! Me encanta todo, pero el sobre rosita me ha enamorado! Lovely cards and photography! I NEED the semi circle stamp set. Love your fabulous ideas. Thanks for the inspiration. 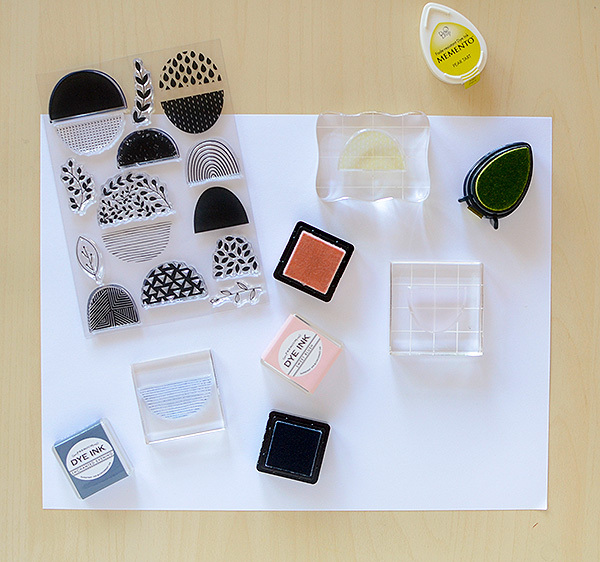 Lovely ideas for using these new stamps. Wow ! Plenty fabulous inspiration for an awesome release. Thank you for sharing. Loving all your projects, so fresh and stylish! 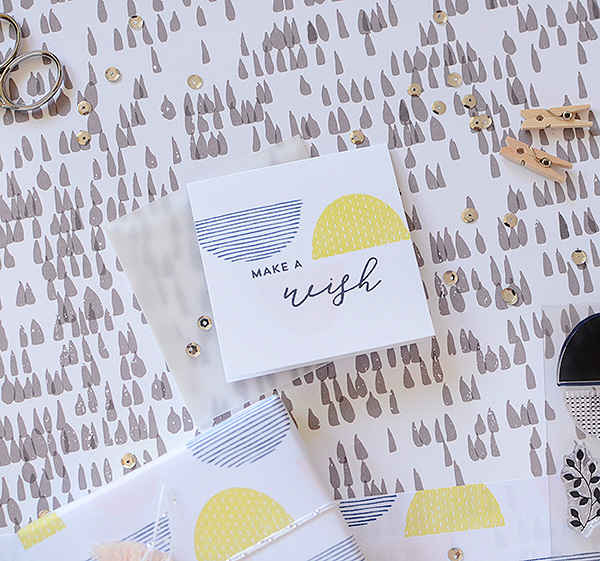 I love the way you made the images into wrapping paper, what a great idea! 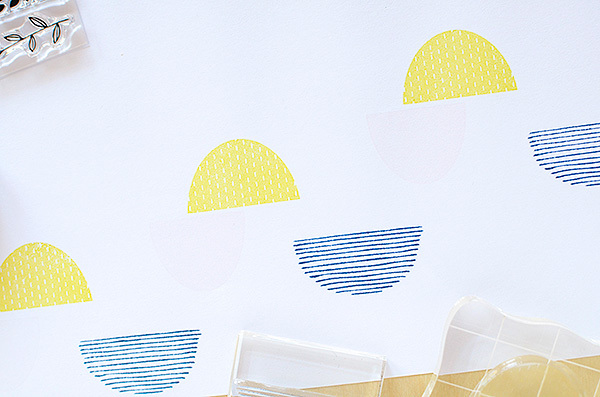 Fun and pretty gift wrap and cards you made with these stamps. Great "custom" made wrapping paper and card(s)! Great stamps to use for Birthday, Graduation Celebrations. Thank You for using the semi circle set. I love the graphic style of the Stamp but I wasn't sure how to use it. I love the custom wrapping paper. lovely projects! So elegant and pretty! Fabulous projects! Love the vellum card. Thanks so much! Your semi circle patterns are awesome. I love the paper. Wow !! That's a lot of very nice projects ideas !! Thanks for sharing ! Love your paper and your cards - very unique and special! Great cards. 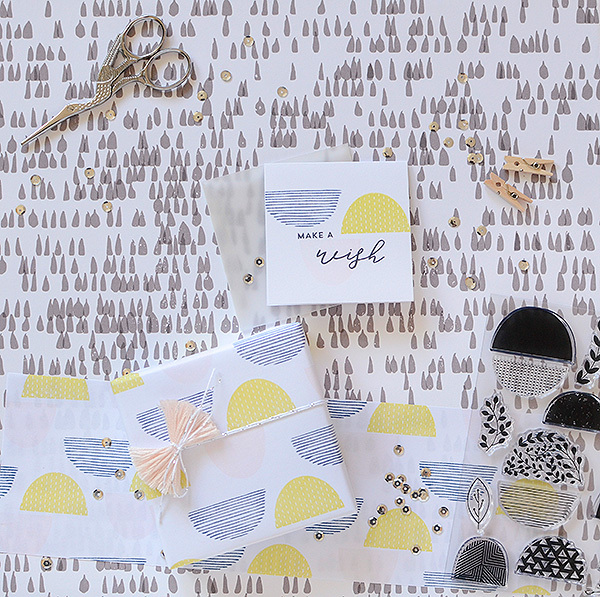 I love how you created your own wrapping paper. 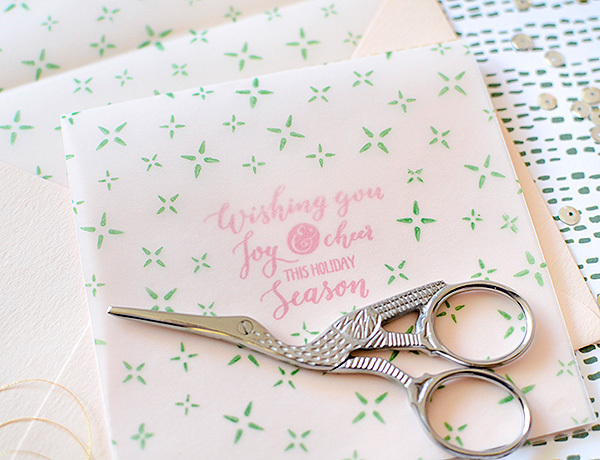 The Semi-Circle Patterns stamp set is so fresh and stylish! 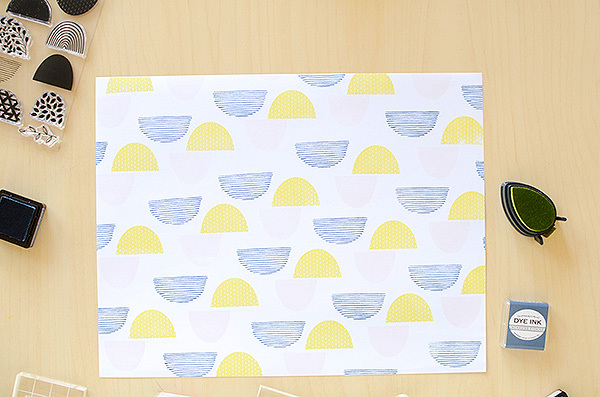 Love how you stamped this modern-looking gift wrap paper! 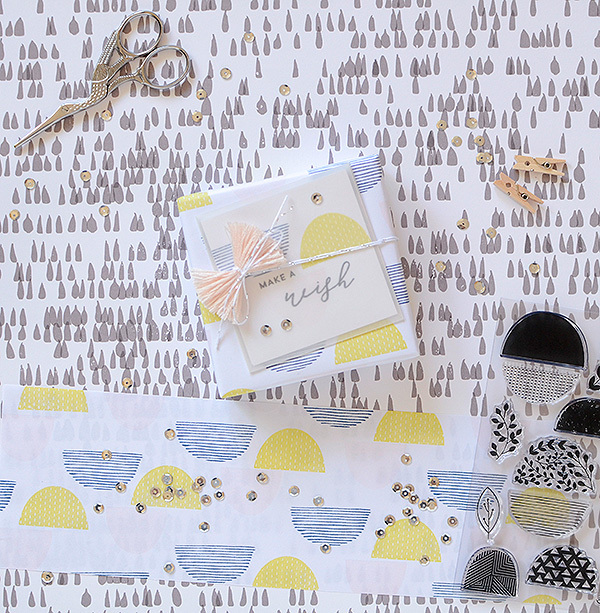 I love the idea of creating my own wrapping paper. Thanks for the great idea. The light bulb card is so fun. Such a great idea to match everything! These are so adorable! Love the packaging! Looks like you've been really busy creating WONDERFUL projects!! Thanks for sharing!! What beautiful projects you've created. You have such a fresh modern design style that really is unique! Really fabulous work! Great cards and love the gift wrap! Everything is so creative and lovely!! So simple, practical and beautiful! Love the ideas. Cute projects! I really like the unique stamps from Pinkfresh. 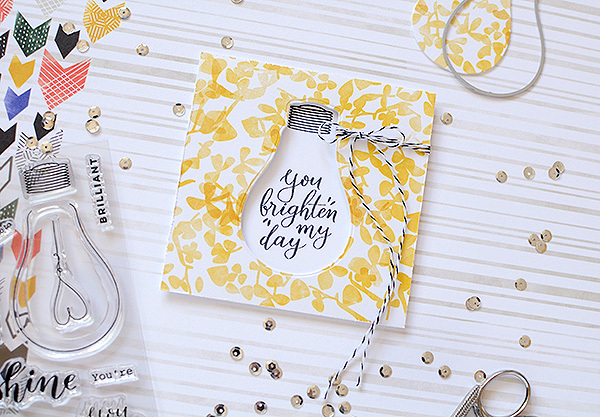 I love the light bulb card, so creative! Wonderful job walking us through how you created your gorgeous projects! My favorite is the wrapping paper and card, so simple and beautiful! Wow, you are so talented. I love your papers and cards. 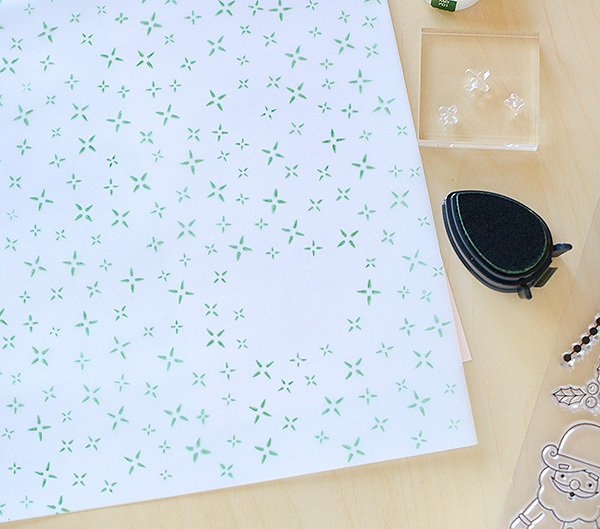 I'm going to try the stamping on vellum, it looks so awesome! 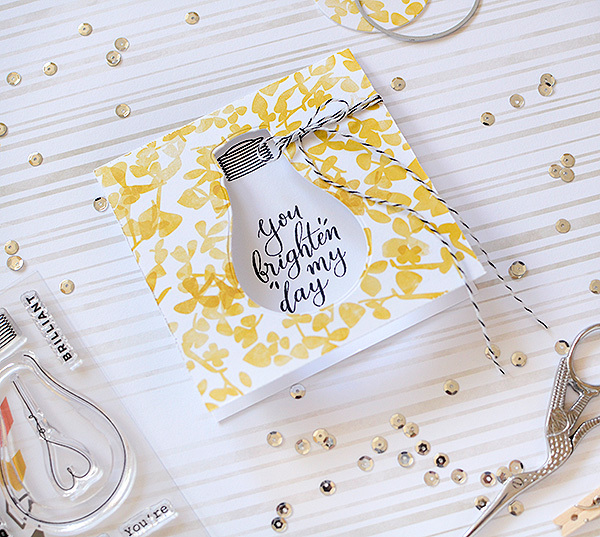 Wow - love how you used the Semi-Circle Patterns, and your light bulb card and the soft vellum of the second card are just beautiful! You are so creative with these sets and I LOVE the light bulb card with the cut out. Thanks for sharing your beautiful designs with us. 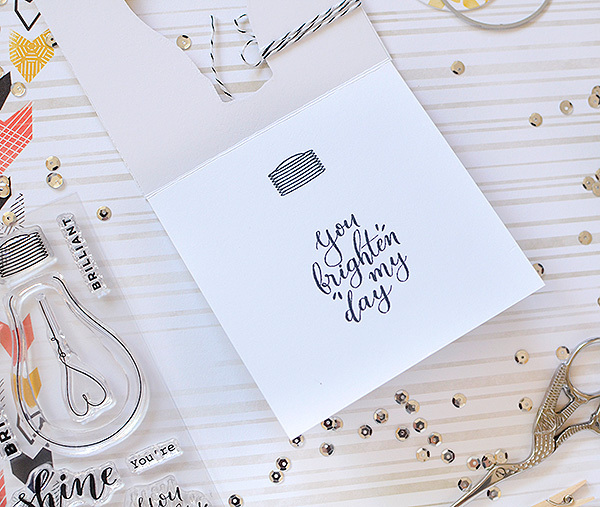 I really like the light bulb card and I like that you made more than just cards! Thanks for sharing your talent! 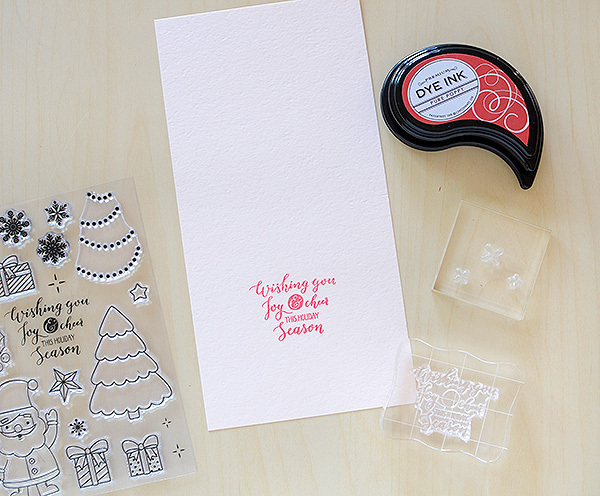 Wow, I really enjoyed seeing a new technique in stamping your ow n wrapping paper. Gorgeous 😄 I love the holidays it's getting harder to pick a favorite. Three beautiful projects! Love, love the packaging/presentation of #1......and the lightbulb card is genius. Love the lightbulb. Clever idea. 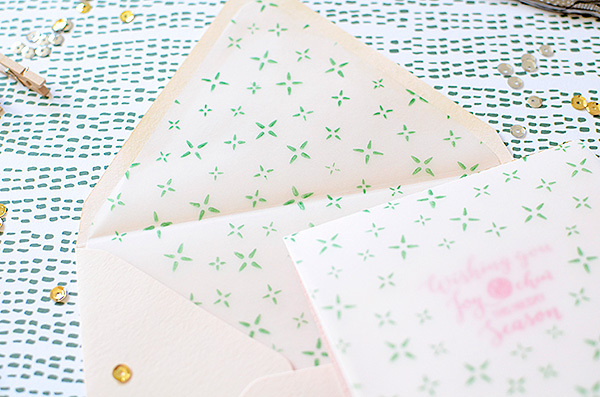 Love these pretty designs! Awesome new sets! Love your beautiful projects! I love your projects...very creative! I never would have thought of the wrapping paper. Or the vellum. Thanks for the inspirations. Wow!! a card and wrapping paper!! Fab idea!! All your projects are awesome!! I love all your samples. The striped semi circles really speak to me. I love the inset light bulb card! Great designs! My son is just finishing his practical for electrician, so I'm loving that light bulb!You have created many wonderful projects with these release products. I'm inspired. Thanks for showing us so many different ways to use these stamps. 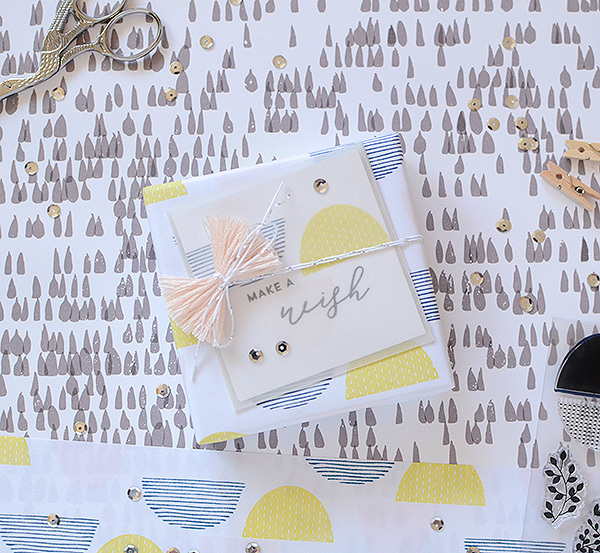 I really love the way you made your own wrapping paper and will have to remember to try that! Oh my!!! Thanks for sharing your awesome projects!!! They're all FANTASTIC!!! That semi-circle set is my favorite from this release! 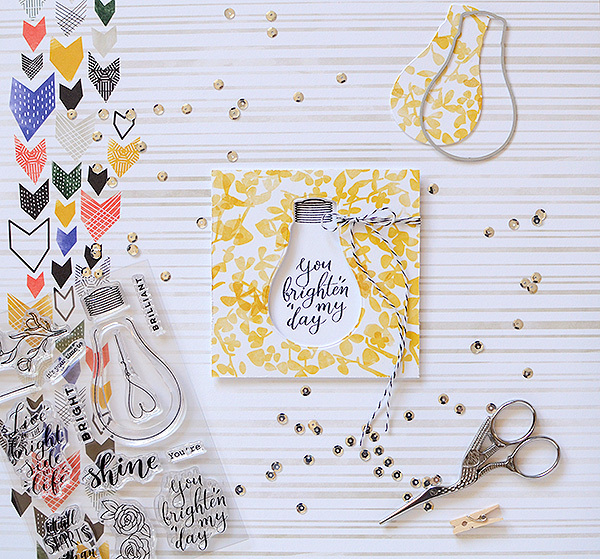 I love the gift wrap you created with it, and LOVE the lightbulb card! Great projects. I'll have to try making my own gift wrap very soon. Thanks for sharing. You always have the prettiest creation and super brilliant at photographing them! Awwww that custom paper is amazing!!! And loving the cards! Especially the lightbulb. Thank you so much for the chance to win! I would love to win this set to improve my creativity in card making. I just got a stamping tool and this would be perfect! Great project by the way! Gorgeous as always! Wonderful use of the stamps and die. 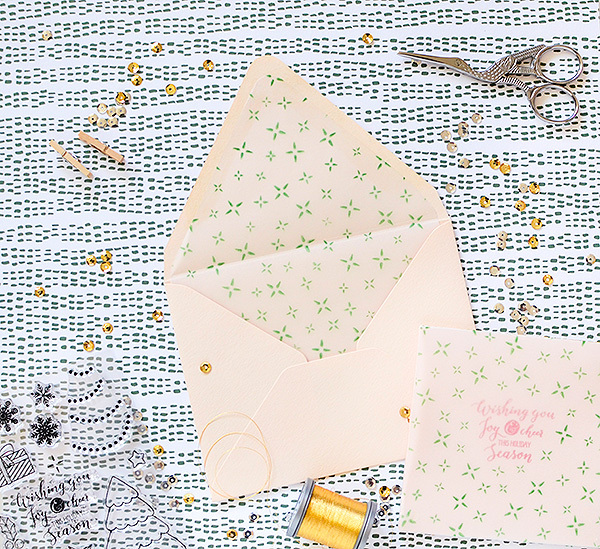 The wrapping paper and the matching card you've created are gorgeous. Fantastic color combination & beautiful card & envelope. Thanks for sharing. Fabulous projects, so many great new products in this release. Rebecca, I adore ALL of your gorgeous projects. Your blog venture is truly fantastic! The Semi-Circle Patterns card is my top choice. 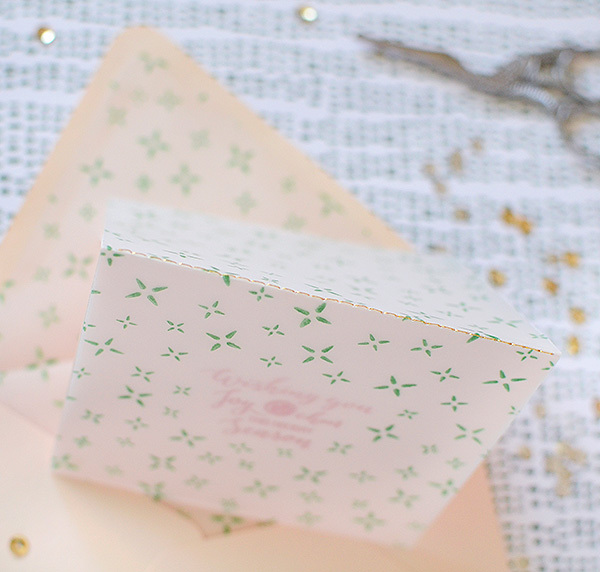 The wrapping paper and the coordinating card you've make are beautiful. The shading mix of this card photographs are astonishing. Creators can idealize bothersome questions in photographs. For this why, picture takers employ a specialist item photograph originators. Wow, I love all of your projects! Your color palettes and eye for design are fantastic!! So many wonderful projects- they are all so gorgeous! You are so creative! Beautiful creations, love them all, so elegant. Thanks! Beautiful projects!! I love your wrapping paper and matching card. Wow what awesome creations! 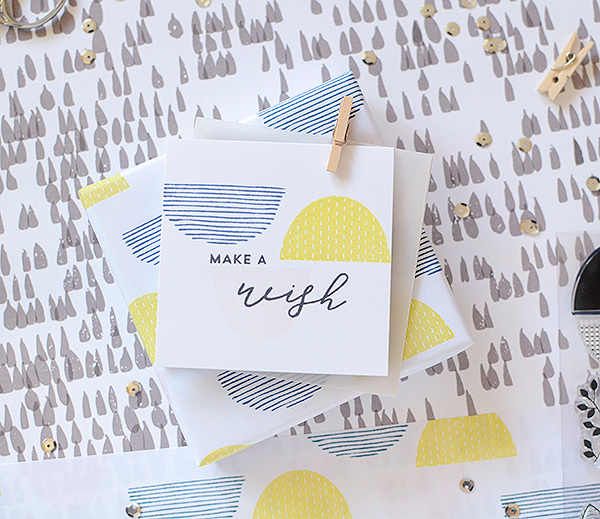 Love the idea of having a matching wrapping paper with the card! Beautiful!!!! Amazing cards and ideas. Beautiful card, the set with the vespa is really gorgeous. what a lovely ideas, you made for us!!! a huge inspiration source. I was thinking what can we do with those half circles, but now after reading your post... I need to find this stamp here in belgium... so lovely. thanks for the inspiration and the chance!!! Its a great idea with vellum stamped! Love your creativity! Fabulous projects. Thank you!